Joe Lyons has signed a one-year deal with Widnes for the 2019 season. 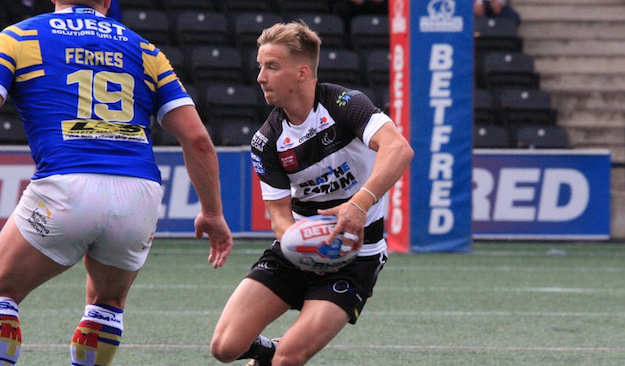 The 20-year-old has been at the Vikings since he was 14 after being picked up at Scholarship level while playing for his local community club, Moorfield ARLFC. Lyons made his first-team debut against Leeds Rhinos in The Qualifiers and then went on to play another three games. He also featured 16 times for North Wales Crusaders on dual-registration in 2018. On his new deal, Lyons said: “Widnes is the only place that I want to play my rugby so it was a no-brainer for me. “Whilst from a club perspective, last year wasn’t great, I feel 2019 went well for me personally. “My spell with Crusaders helped me to develop as a player and keep match-fit for when I was given the chance at Widnes. It was a great honour for me to make my debut for my hometown club this year and then stay in the side for the back end of The Qualifiers. “There’s a lot of young talent at the club that is coming through, and that’s why I wanted to stay as I feel like we can do something with this group of lads.